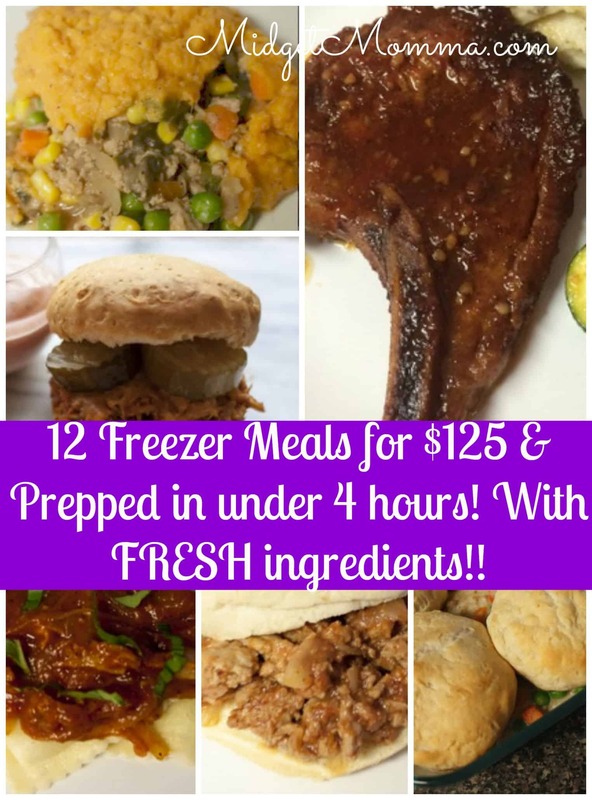 Twelve Healthy Freezer Meals For $125!! 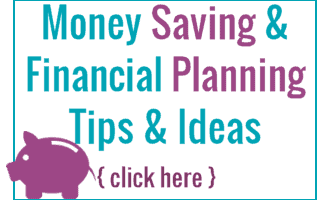 Freezer meals are a great way to save time and money. With this set of Freezer meals you will be able to make 12 healthy meals to have in your freezer in under 4 hours (much of the cooking done in that time too) and all of them are from scratch and for me the cost was $125 (I shopped at the commissary but the prices are not much different then the regular grocery store)! That comes out to just $10.41 per meal which is MUCH cheaper then getting take out AND the freezer meals are made with fresh ingredients. Plus make sure you check out our other Freezer to Crockpot meals: Prep 16 meals with fresh ingredients in about an hour post for more freezer recipes and another shopping list with recipes:) This took me about 4 hours, but at the same time having to stop a few times (after things were cooked of course) so it could be done in as little as 2 hours! Since baby D is due in just two weeks I figured it was time to get my freezer ready for after he is born. When I had my daughter we ate way to much junk food and take out. I have seen so many of these freezer meal list that are not better options. They just use things like cream of chicken soup in everything! Well these are made from scratch and love recipes! When you are making this you will need to double each of the recipes. 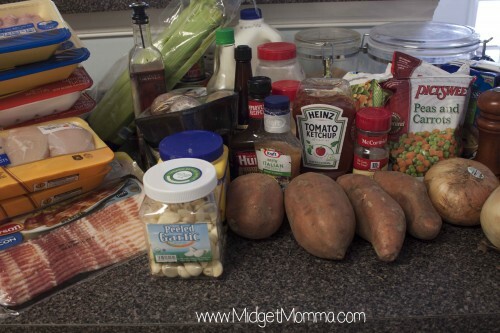 A few meals will just need some rolls and side dishes but this will save you so much trouble when you don’t have the time on your hand to cook. To start I like to take out everything I am going to need to make my dishes ( I place the refrigerated stuff in one spot in the fridge.) 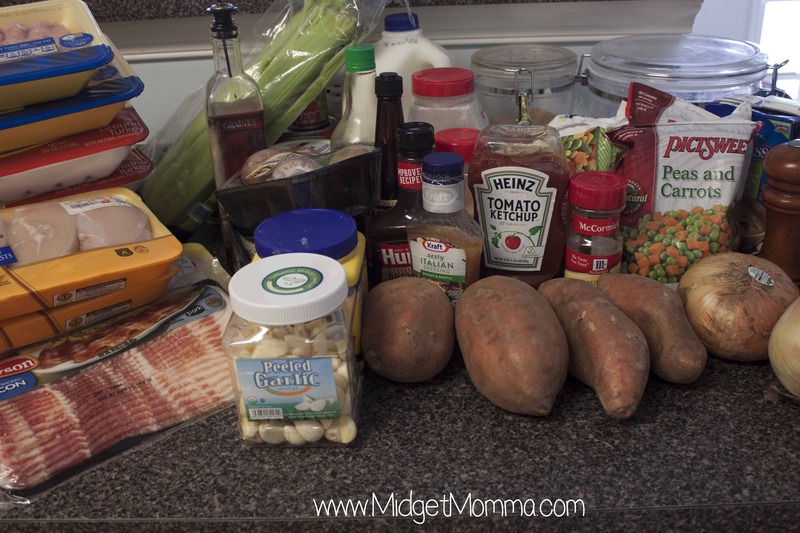 Everything but the Crock Pot Pork Chops and the Slow Cooker Barbecue Pulled Chicken I will be cooking ahead of time. Since those are just crock pot meals I am able to just pull those out of the freezer the night before than in the morning I place in the crock pot. I start off by cooking all the meat and chopping all the vegetables while they cook. 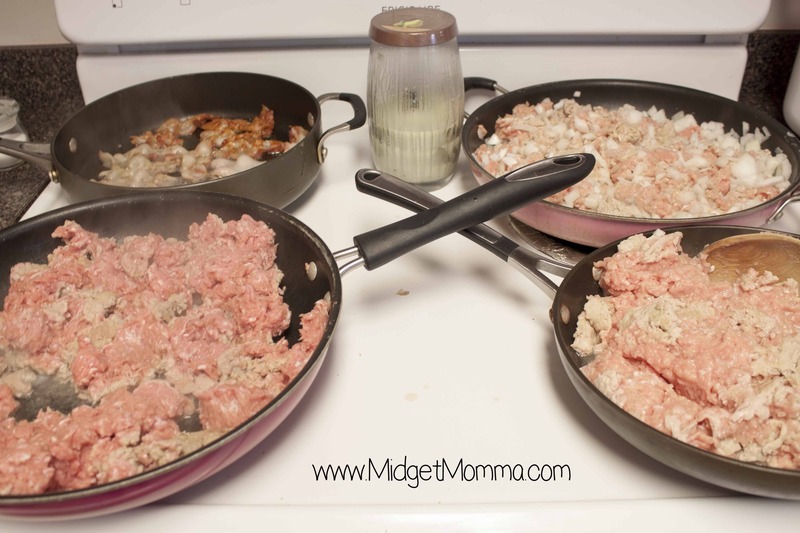 In each pan I had the full double recipe going. For the shepherds pie I decided to hold off on making the sweet potato mash because I am not a fan of reheated potatoes but if you are going to make them make sure you store them in a separate freezer bag. I make sure I label the bags with what they are and simple directions so my husband will know what to do with them lol. 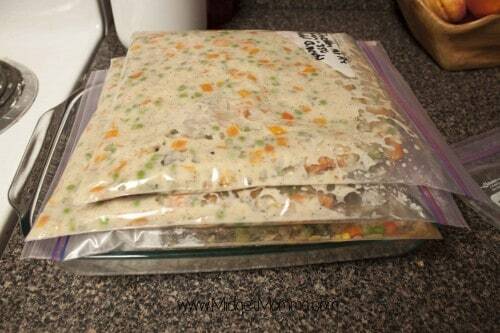 When you go to freeze them I recommend placing them flat so they will take up less room in the freezer.